Fort Laramie was located at the Crossroads of a Nation Moving West. In 1834, where the Cheyenne and Arapaho traveled, traded and hunted, a fur trading post was created. Though it was not a military fort at first, it was called Fort William and soon became known as a place of safety, as settlers moved across the continent. By the 1840s, wagon trains rested and re-supplied here, bound for Oregon, California, and Utah. In 1841, Fort John was constructed, replacing the original wooden stockade of Fort William. Built of adobe brick, Fort John stood on a bluff overlooking the Laramie River. 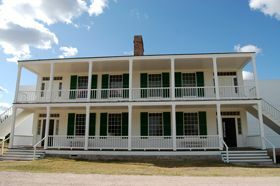 It was named for John Sarpy, a partner in the American Fur Company, but was more commonly called Fort Laramie by employees and travelers. Fort Laramie, the military post, was founded in 1849 when the army purchased the old Fort John for $4000, and began to build a military outpost along the Oregon Trail. For many years, the Plains Indians and the travelers along the Oregon Trail had coexisted peacefully. As the numbers of emigrants increased, however, tensions between the two cultures began to develop. To help insure the safety of the travelers, Congress approved the establishment of forts along the Oregon Trail and a special regiment of Mounted Riflemen to man them. 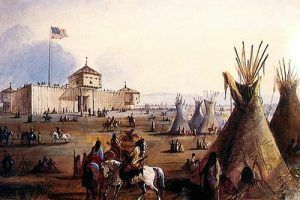 Fort Laramie was the second of these forts to be established. The popular view of a western fort, perhaps generated by Hollywood movies, is that of an enclosure surrounded by a wall or stockade. Fort Laramie, however, was never enclosed by a wall. Initial plans for the fort included a wooden fence or a thick structure of rubble, nine feet high, that enclosed an area 550 feet by 650 feet. Because of the high costs involved, however, the wall was never built. Fort Laramie was always an open fort that depended upon its location and its garrison of troops for security. In the 1850s, one of the main functions of the troops stationed at the fort was patrolling and maintaining the security of a lengthy stretch of the Oregon Trail. This was a difficult task because of the small size of the garrison and the vast distances involved. In 1851, a treaty was signed between the United States and the most important tribes of the Plains Indians. The peace that it inaugurated, however, lasted only three years. In 1854, an incident involving a passing wagon train precipitated the Grattan Fight in which an officer, an interpreter, and 29 soldiers from Fort Laramie were killed. This incident was one of several that ignited the flames of a conflict between the United States and the Plains Indians that would not be resolved until the end of the 1870s. The 1860s brought a different type of soldier to Fort Laramie. After the beginning of the Civil War, most regular army troops were withdrawn to the East to participate in that conflict, and the fort was garrisoned by state volunteer regiments, such as the Seventh Iowa and the Eleventh Ohio. The stream of emigrants along the Oregon Trail began to diminish, but the completion of the transcontinental telegraph line in 1861 brought a new responsibility to the soldiers. Inspecting, defending, and repairing the “talking wire” was added to their duties. 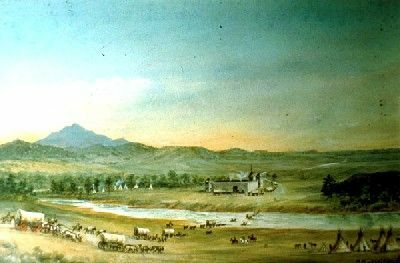 During the latter part of the 1860s, troops from Fort Laramie were involved in supplying and reinforcing the forts along the Bozeman Trail, until the Treaty of 1868 was signed. Unfortunately, the Treaty of 1868 did not end the conflict between the United States and the Plains Indians and, by the 1870’s, major campaigns were being mounted against the plains tribes. The discovery of gold in the Black Hills, in 1874, and the resultant rush to the gold fields had violated some of the terms of the treaty and antagonized the Sioux who regarded the Hills as sacred ground. Under leaders such as Crazy Horse and Sitting Bull, they and their allies chose to fight to keep their land. In campaigns such as the ones in 1876, Fort Laramie served as a staging area for troops, a communications and logistical center, and a command post. Conflicts with the Indians on the Northern Plains had abated by the 1880s. Relieved of some of its military function, Fort Laramie relaxed into a Victorian era of relative comfort. Boardwalks were built in front of officers’ houses and trees were planted to soften the stark landscape. By the end of the 1880s, the Army recognized that Fort Laramie had served its purpose. Many important events on the Northern Plains had involved the Fort, and many arteries of transport and communication had passed through it. Perhaps the most important artery, however, the Union Pacific Railroad, had bypassed it to the South. In March of 1890, troops marched out of Fort Laramie for the last time. The land and buildings that comprised the Fort were sold at auction to civilians.